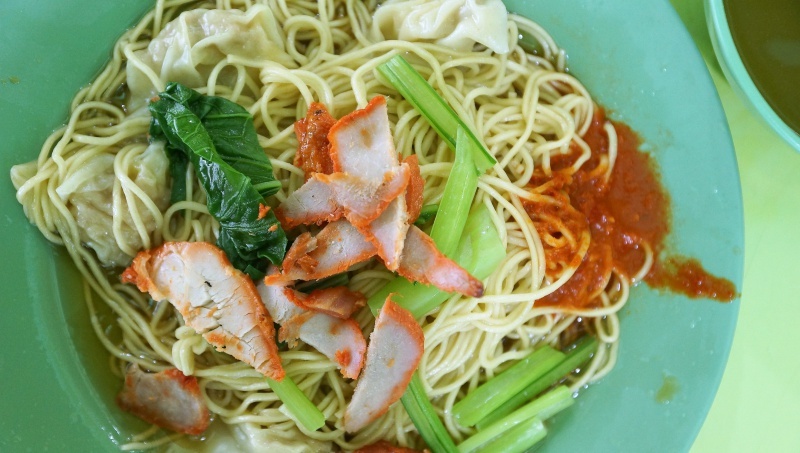 There are two popular wanton stalls housed in Dunman Food Centre. At the lower deck, you can witness the famous Joo Chiat Ah Huat Wanton Mee luring its loyal customers, while on the upper deck, find Dunman Char Siew Wanton Mee – another wanton mee stall that is too, flexing its arms to entice the customers with its plates of alluring wanton noodles. We tried both the stalls and here is our verdict. You can read our review on Joo Chiat Ah Huat Wanton Mee here. 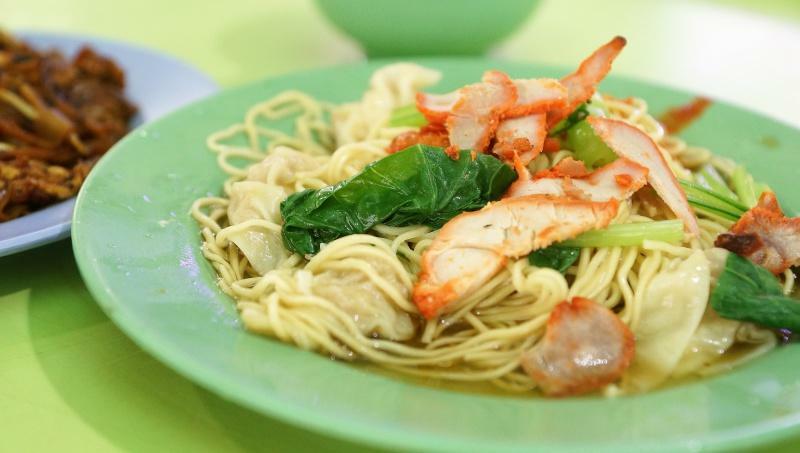 Dunman Char Siew Wanton Mee serves the same wanton mee but in a completely different style. Toppings included are the usual char siew and boiled chye sim, with egg noodles which are a paler yellow in comparison to many other wanton mee stalls. The four plates of noodles we ordered were all cooked to an al dente, ensuring that they were and firm and springy at each bite. The noodles were tossed in the sesame oil, soy sauce and a specially-made broth to keep the noodles moist. A spoonful of bright red Chili sauce was also served alongside the plate, which is a killer here with its ferocious, tongue-burning kick. The presentation and style here possesses a close resemblance to the famous Eng Wanton Mee – a stall with a legacy which started from this humble food centre as well, but has since grown into a well-established restaurant along Tanjong Katong Road. Dunman Char Siew Wanton Mee was slightly more tame with its seasoning compared to Eng’s Wanton Mee which has more robust flavours, but it was good enough to win our hearts over. The fiery chili sauce elevated the “shiokness”, which is something we could not find with its lower deck rival – Joo Chiat Ah Huat Wanton Mee. The wantons are packed with mouth-watering filling, while the char siew was just ordinary. 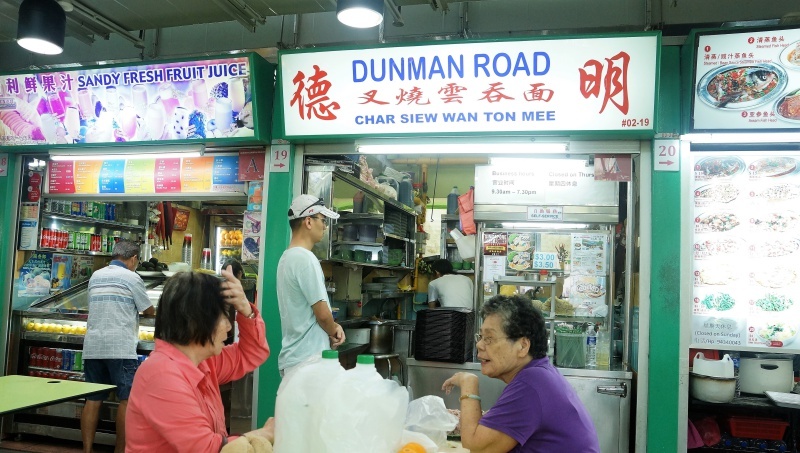 The chili sauce may pose as a challenge for some but if you would like to enjoy a plate of good, shiok wanton noodles, look no further than Dunman Char Siew Wanton Mee. Be it the noodle texture, seasoning, chili sauce or the delectable wanton, this stall has an edge over Joo Chiat Ah Huat Wanton Mee. The only hiccup we experienced with Dunman Char Siew Wanton Mee is their inconsistency in cooking the soup to its perfect sweetness. The bowl of soup was tastier on our subsequent visit, as compared to our first visit a week before when the soup was completely bland and mediocre. This is definitely an area for the stall to pay more attention to, since the noodles are tossed with the same base soup and that could affect the overall taste to a decent extent. 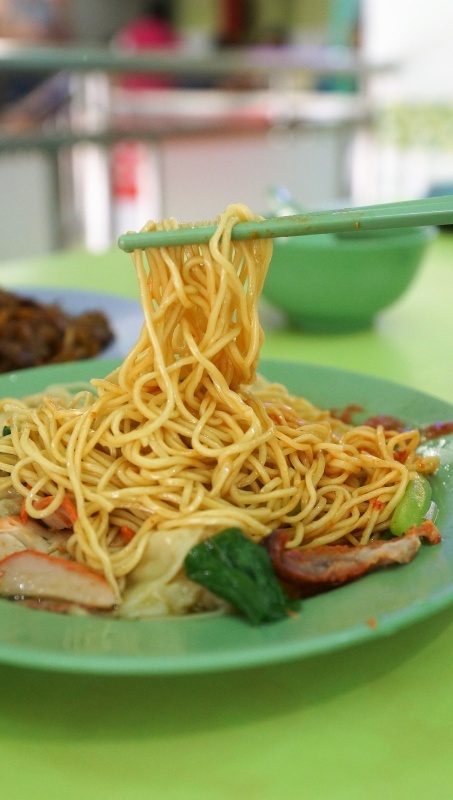 Joo Chiat Ah Huat Wanton Mee might have captured a large pool of followers but our hearts are unequivocally leaning towards Dunman Char Siew Wanton Mee. We like the texture of the noodle and the scorching chili sauce, leaving us more satisfied overall.